I apologize for the tardiness in getting my post up today! I've been struggling a touch since I broke my knee cap and by the time I get home from work after trekking around in this cumbersome cast, I'm pretty pooped!!! 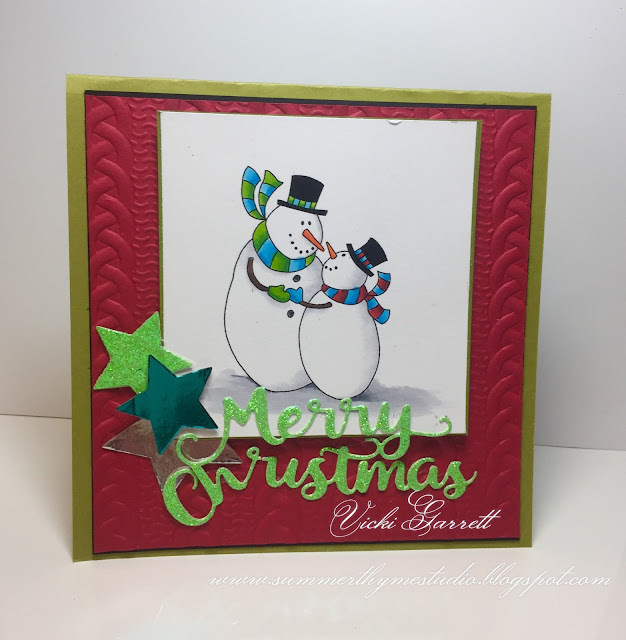 This weeks challenge is to create a Christmas Card. There are so many fabulous new Christmas images that it was hard to choose which one to pick, but I've got a couple to share with you!!!!! It's big and beautiful for colouring. For the top, I painted on some Mint Metallic Gilding Paste from Cosmic Shimmer. It's so pretty and just gives the ornament a vintage look. 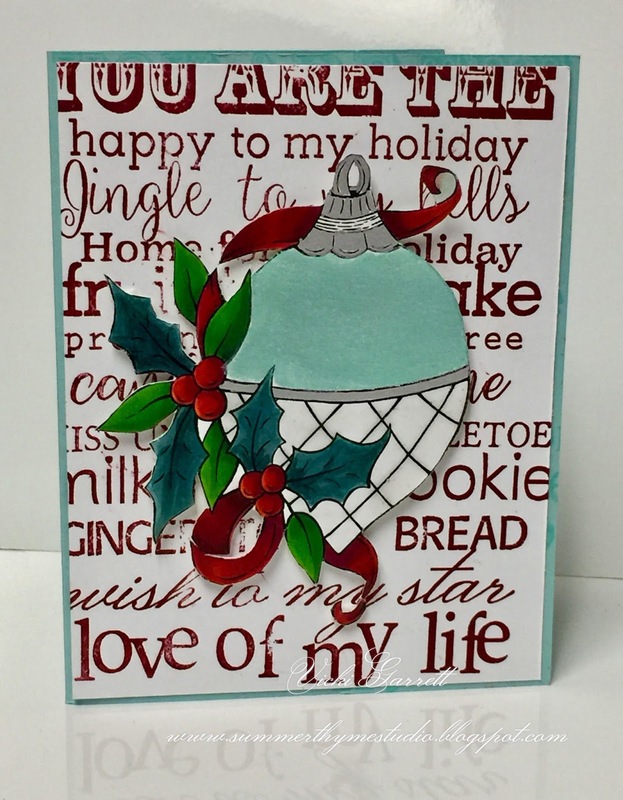 I added Irrestable Pico Embellisher in Shimmer to the bottom of the ornament to give it a glass like effect. I fussy cut the ornament and mounted it on foam dimensionals, but not before I stamped the white background with this fabulous You are the background stamp! I LOVE LOVE LOVE this fun sentiment!!!! 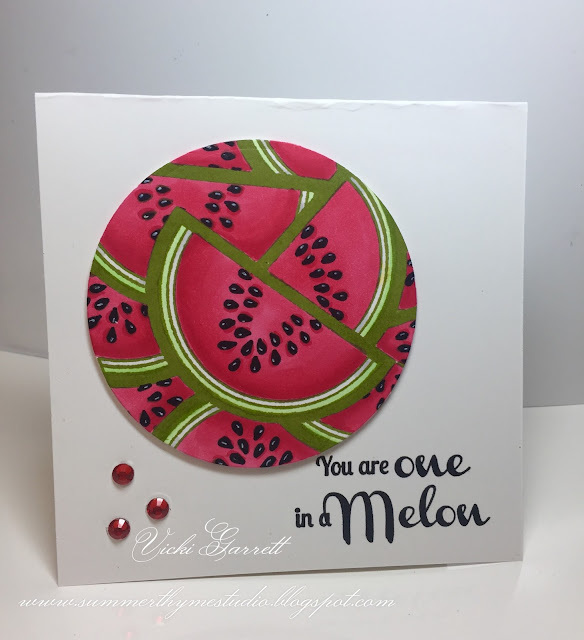 Check on the IO Blog to post your card and get all the scoop on the challenge!!! Here's who is playing along today!!!! And finally, the last day of the Impression Obsession Fall Winter Blog Hop. I sure hope you've enjoyed hopping this week and seeing a lot of the new products!!! 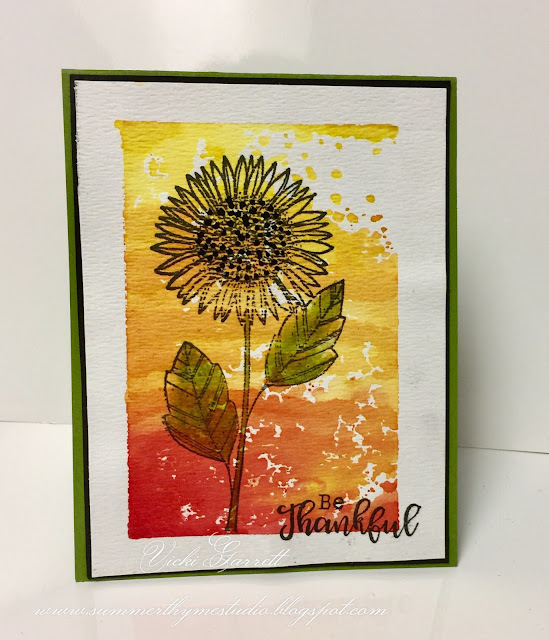 I stamped the sunflower directly over my watercolor block background. Here we are at day 4 of the Impression Obsession Fall/Winter Blog hop. I sure hope you are enjoying it so far!!! You should be on the last stop of the hop!!!! That is often the case with me as my name begins with "V"! 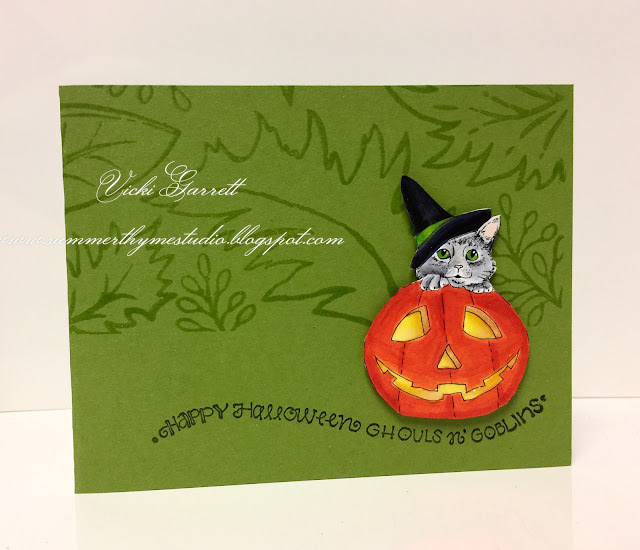 I stamped the Pumpkin Kitty and Ghouls and Goblins sentiment in Black Ink and coloured in the image with Copic and Touch Markers. I added some Irresistible pico embellisher to the eyes, nose and mouth in the pumpkin to give it a litle pizzazle!!! !I like this card because it was quick and easy to make!!!! Once again, be sure to visit our fabulous IO Design Team’s blogs (only one comment per blog per day please) for a chance to win one of 6 $25 Gift Certificates! One winner will be chosen each day and then an extra winner will be chosen randomly from all hop days. Comments on all hop days will be open until July 23rd at 9pm CT. All winners will be announced on July 24th. If you’ve arrived from Laura's Blog you’re at the right place. If not please head to the Impression Obsession blog to start at the beginning of the hop. Have a most amazing day!!!! Here we are with day three of the Impression Obsession 2017 Fall/Winter (and more!) Stamp Release Hop! We have some beautiful new stamps to share AND Gift Certificates to give away! 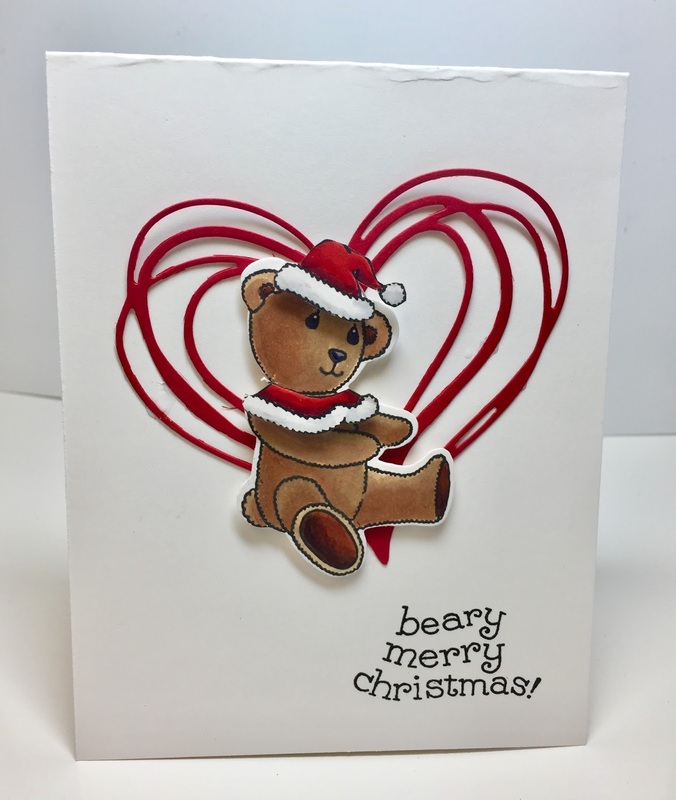 Today i'm showcasing the Beary Christmas stamp set that accessorizes the Beary Sweet stamp set. I coloured the bear and the collar and hat with Copic markers. Welcome to day two of the Impression Obsession 2017 Fall/Winter (and more!) 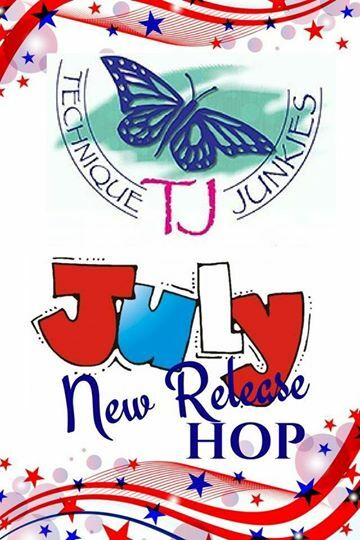 Stamp Release Hop! We have some beautiful new stamps to share AND Gift Certificates to give away! Moving right along from Halloween to Christmas!!!! Who doesn't love a Snowman, or even two!!!! This Snowman stamp is super cute and easy to colour!!! I coloured the festive pair with my Copic Markers. I love this cable sweater embossing folder, which is perfect for wintery cards!!!! I hope you enjoyed my share for today!!! is just a perfect image to start with!!! 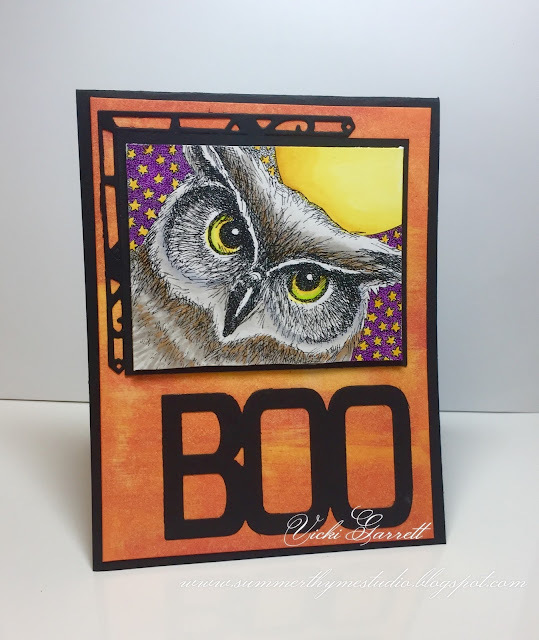 I created the orange coloured background by going direct to paper with CANARY and ORANGE Hybrid Ink by Impression Obsession. 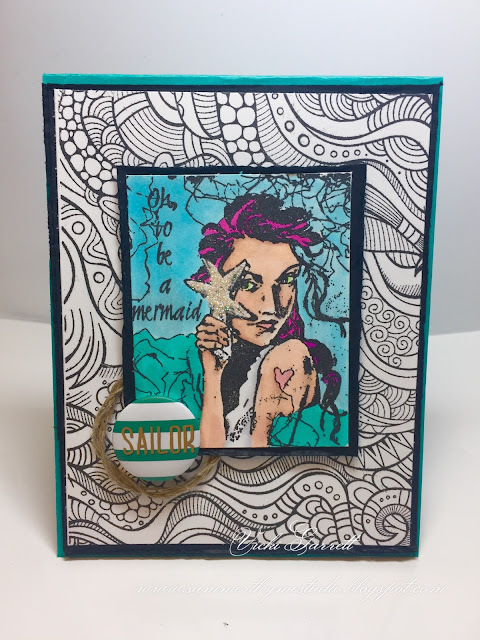 If you haven't tried the new ink pads, you may want to do so, they're amazing!!!! I coloured the super sweet image using my copic and touch twin markers. 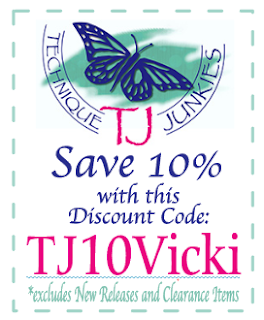 Be sure to head over to the Technique Junkies Blog to for more info on this Fun Summer Creations!!!! I coloured the Mermaid Image with Copic Markers, adding some soft beige glitter to the Star Fish. I kept the background plain as I didn't want the colours competing with the main image. Sure hope you enjoyed my share! Here is the blog hop in order!!!! 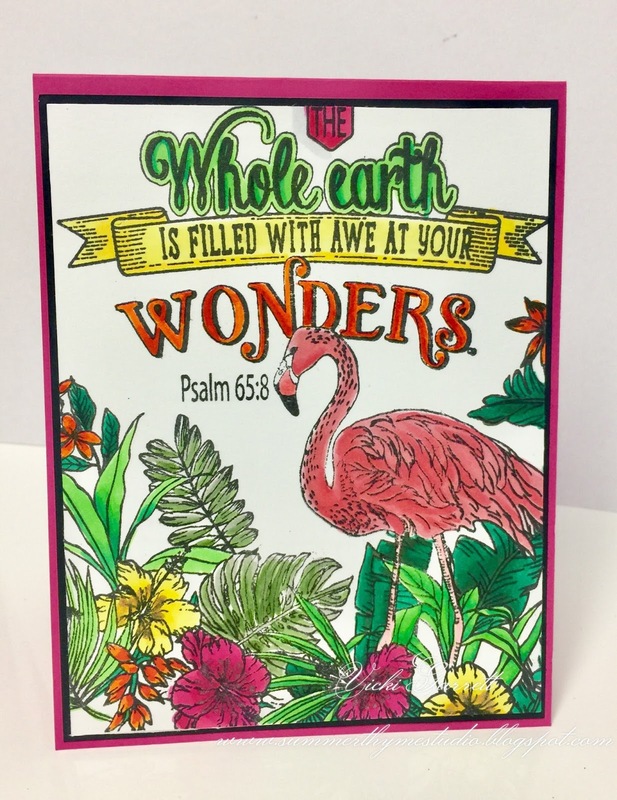 Be sure to visit the Design Team Blog to read about the great deals on the new stamps!! !